New England Patriots quarterback Tom Brady was involved in a two-car crash this morning in Boston, when his Audi S8 tangled with a minivan. Brady declined medical treatment, but reports say he suffered multiple injuries.UPDATE:New details below. 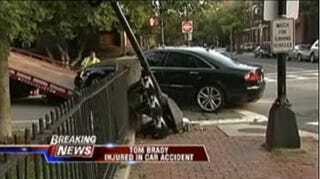 The accident was reported near Brady's home in Boston around 6:15 a.m. Footage from the scene shows the front end of Brady's Audi wicked scrunched, with matching damage to the rear of a Mercury Villager. A male passenger in the rear of the minivan had to be removed with the jaws of life and taken to a Boston hospital. Brady went to Gillette Stadium and will reportedly be checked over by Patriots medical staff, as well as tens of thousands of overly obsessive fantasty football managers. UPDATE:The car Brady was driving was an Audi loaner. The man injured in the other vehicle is in serious condition.